11 P.M. are an indie rock band who consist of four members; SyKwan (vocals), Lung Ray (guitar/vocals), San (bass/vocals) and Jimmy Fong on drums. 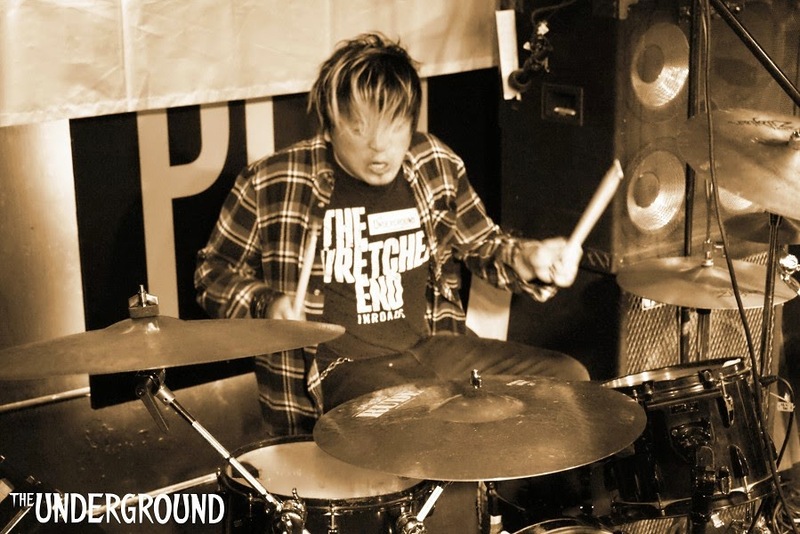 I was interested to see how Jimmy played as he recently received the award for Best drummer at the Underground x Parsons battle of the bands while playing with 11P.M. 11P.M. started with “Hearts stop Beating” and they encouraged the crowd to help them start with a clap to initiate their set. The drums kick in and take over the clapping and people began to feel the groove. Sykwan sings in Cantonese so I had no idea what he was singing about. It is not exactly conversational Cantonese, so it goes over my head. The style of his voice was something similar to many other Canto-Indie pop bands I have heard in the past. For me he was another version of Rocky from Killersoap; who is definitely something special. SyKwan wasn’t as good as Rocky in my eyes, but he had loads of potential. Maybe this is where he gets his inspiration from. The four-piece really had a great stage presence and they received a huge applause at the end of their song. Their next song, “Let Go” started with a bang and a really impressive start. Again, the arrangement of the lyrics was so familiar for me. In the chorus there was more variation in his voice that gave the song that something extra. “Why don’t you forget” had another heavy intro and had some sweet vocals that propelled the song. The instruments sped up during the chorus, while being slower in the verses. As we move to towards the end of the song all the instruments and vocals come together in a mass crescendo which even include a few nice screams. The notes that I wrote for “Find Your Way” had found their way out of my pocket even before I had a chance to take a photo of all of my notes. Luckily this wasn’t these guys first performance and so I was able to re-jog my memory about their last song. It was another song with a prominent drum beat and those Canto lyrics that I really want to understand, but can’t. The music break in this song was really cool and I liked the interaction with the crowd in this song. The screams towards the end of the song topped it off for me. It had been a good night. Would I recommend you see 11P.M? For sure! 熱血相信是11:PM決賽演出的最佳形容詞，特別是最後Power Rock曲風的<Find Your Way> , 副歌部份不斷重覆歌詞”找到嗎, 但我們始終卻找不到”, 看著他們雖然可能還是迷途在搖滾的路上, 但仍深信不疑地出盡全力演出實實在在的撼動了我,。他們可能還未找到自己一直追求的東西, 但相信已抓住了每一個看過他們演出的觀眾的心, 繼續努力, 11:PM的四位大哥!